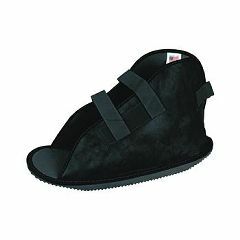 Features beveled rocker sole to allow normal walking motion and balance. Attractive tan vinyl upper is easily wiped clean. hook and loop closures and ripple sole help prevent slipping. Open toe/closed heel; fits either foot. Size; length x width of foot. I am amazed at the wonderful customer service and quick shipping I get from AllegroMedical, and I've never been disappointed in their products.